(French-American-British) a classification of acute leukemia produced by a three-nation joint collaboration; acute lymphoblastic leukemia is subdivided into three types and acute myelogenous leukemia is subdivided into eight types. 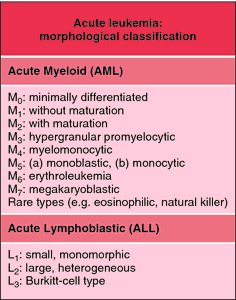 French-American-British (FAB) classification of acute leukemias: the myeloid leukemias are divided into eight types (M0-7) and the lymphoblastic leukemias into three (L1-3). From Hoffbrand and Pettit, 2000. French-American-British classification of acute leukemias based on the study of microscopic features and cytochemistry of blast cells; it subdivides acute myelogenous leukemias into 8 groups (M0-M7) and acute lymphoblastic leukemias into 3 groups (L1-L3); widely used in clinical practice. (French-American-British) a classification of acute leukemia produced by a three-nation joint collaboration. Acute lymphoblastic leukemia is subdivided into three types and acute myelogenous leukemia is subdivided into eight types. It is concluded that AML M2 and M4 were the most common categories of FAB classification at our centre. Antigen expression in AML by FAB classification categories. FAB classification of acute leukaemia was applied for sub-typing. The original FAB classification was based for many years on the arbitrary cut-off point of 30% bone marrow blasts and in the past some patients with 20%-29% blasts remained stable for months without chemotherapy. Although the FAB classification has not been formally updated since its 1985 revision, other investigators modified the FAB classification informally by expanding the M6 category to include M6a and M6b subtypes. SuperGen conducted a randomized open-label, multicenter, controlled trial that evaluated 170 adult patients with myelodysplastic syndromes meeting FAB classification criteria and IPSS High-Risk, Intermediate-2 and Intermediate-1 prognostic scores.